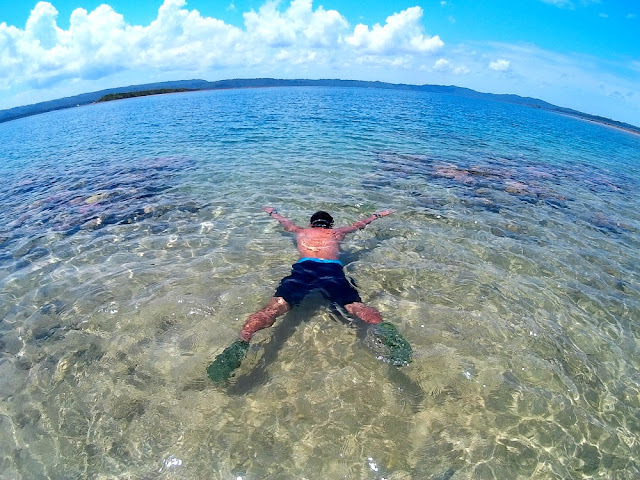 It was one groggy morning that I woke up at C-Fish Cage and Sandbar in Hinatuan, Surigao del Sur where I decided to stay for three days after I had my Bacolod-Bantayan,Cebu trip. The stilt resort that stands off coast of Brgy. Talisay, was actually a fish cage converted into a sort of cheap accommodation for visitors who wish to have an overnight stay after visiting Enchanted River. You will be amazed with the different color, sizes and species of fishes below the deck. The resort operator would even allow you to feed the fish if you wish to. But the most desirable thing to do is to swim inside the fish cage and feed them up-close and personal. Many would think that this is dangerous but NO it isn't as long as you know how to swim of course. These fishes are actually afraid of anyone that would come nearby unless you are a dead organism that they would think of as food offered to them. For the information of the public, you can also catch fish from these cages for a minimum fee. You can also request from the resort's mainstay chef to cook it for you.